Square Enix's upcoming Dragon Quest Builders has been a hot topic here at Modojo since its announcement, but now it's seeming more and more like a real thing (at least in my mind) so as we near closer to release it's obvious we'll hear a little more about what to expect. 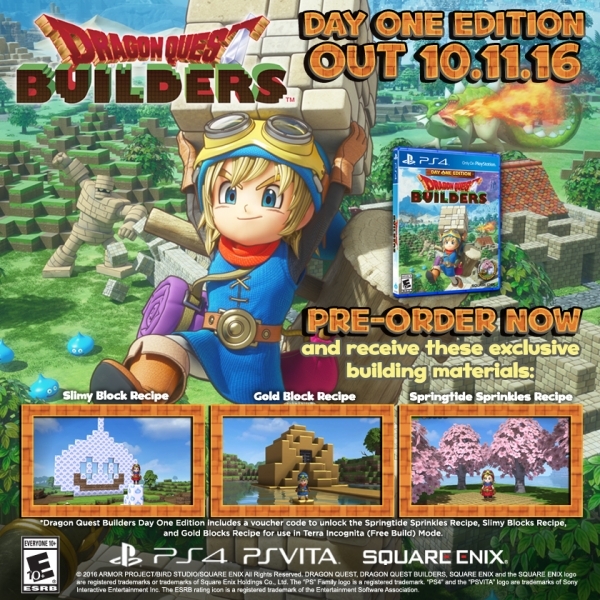 If you're the type of person to want to pick up a game the day it's released, you'll want to check out the Day One Edition of Dragon Quest Builders, which is releasing for PlayStation 4 and PS Vita on October 11. It'll come packing special in-game building items like the "Slimy Block" recipe, "Springtide Sprinkles" recipe and "Gold Block" recipe. I was honestly hoping for some kind of cool figurine or something of the sort, but I'll take what I can get.